Crepes are a high/low sweet. They can be the finish of a luxe meal or a snack you pick up at an outdoor stand and eat on the run. 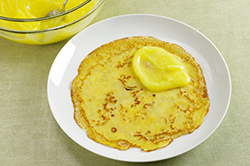 Perhaps the most famous crepe dish is crepes Suzette, a dish that’s attributed to a mistake. In 1895, Henri Charpentier, who would later become a great chef, was a young waiter in Monte Carlo charged with serving crepes to the Prince of Wales, who would later become the King of England. In that age of tableside service, Charpentier had a pan of liqueurs at the ready to make a sauce for the guest, when the alcohol went up in flames. The waiter may have been young, but he was resourceful – he quickly slid the crepes into the pan of boiling liqueur, swirled them around, and, with extraordinary élan, presented them as Crepes Princesse, honoring Suzanne, Edward’s daughter, who was at the table. Later the name was changed to Suzette, ostensibly at the prince’s request. Not surprisingly, the paper-thin pancakes get simpler treatment on Paris streets, where crepe stands are abundant. Often you’ll see a stand about the size of a telephone booth attached to a café or on a street corner, and when you go to markets, you’ll find mobile crepe and waffle trucks, usually with lines of eager snackers in front of them. 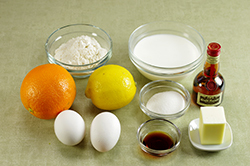 The most popular toppings for snack crepes are sugar and butter (put a pat of butter on a hot crepe, spread it as it melts, and sprinkle with sugar), jam or marmalade, Grand Marnier (a splash creates a crepes Suzette moment), Nutella, or, for a splurge, Nutella topped with thin slices of banana. 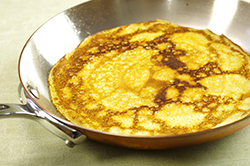 The crepes are made on large round griddles: the batter is smoothed over them with a long wooden spatula, and then, when both sides of the crepe are cooked and the topping has been added, the spatula is used to fold the crepe into quarters. You end up with a four-layer triangle of crepe that, wrapped in a piece of waxy paper, is not just delicious, but the best hand warmer on a winter’s day. 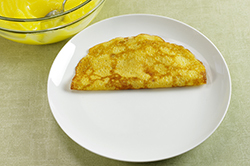 Usually street-corner crepes are made with the simplest ingredients, but when you’re making crepes at home, there’s no reason not to make them with a little extra butter and a spoonful of dark rum, so that even if all you do is sprinkle them with sugar, you’ve got crepes with a lot of flavor. 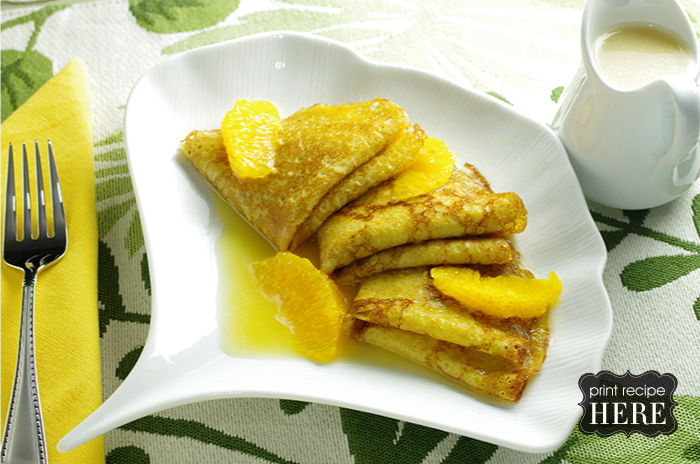 If you’d like to do more than sugar the crepes, you can fold them into triangles, fill them with lemon curd (delicious but optional), and drizzle over a sauce with all the flavors of the original Suzette. The sauce comes from Pierre Hermé, and while it’s simpler than the classic, it’s no less seductive. 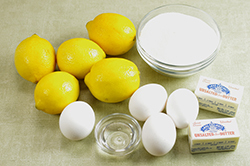 If you want to fill the crepes, spoon some lemon curd onto the upper-right-hand quarter of each crepe, fold the crepe up from the bottom, so you cover the filling, and finish by folding the left half of the crepe over the right, forming a triangle. If you’re not filling the crepes, fold them in quarters. 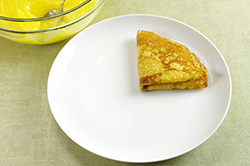 Arrange the crepes on plates, drizzle the sauce over them, and serve immediately. Storing: You can make the crepe batter and sauce a day ahead and keep them covered in the refrigerator; reheat the sauce gently before using. 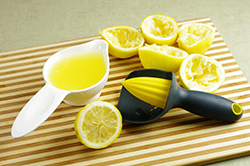 You can even make the crepes ahead. Let cool, then wrap them airtight and keep them in the refrigerator for up to 1 day or in the freezer for up to 2 months; if you want to freeze the crepes, stack them, putting a piece of wax paper between each crepe, and then wrap them airtight. Thaw, still wrapped, in the refrigerator. To reheat the crepes, wrap them in aluminum foil – it’s best to make 2 packets – and put them in a 350-degree-F oven for about 5 minutes. This recipe was given to me during a cooking class I took with Jacques Pourcel, who, with his brother Laurent, has a Michelin-starred restaurant in Provence and nineteen other restaurants around the world. At least I thought this was the recipe the chef handed out, but after I made it and was delighted with the results, I realized I’d made a mistake. I was supposed to use just yolks, and instead I made the curd with the whole eggs. Made my way, the curd is just a tiny bit lighter and just a little less fussy to cook, since whites can take more heat than yolks. 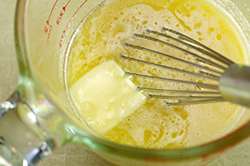 In a medium heavy-bottomed saucepan, whisk the sugar and eggs together until blended. 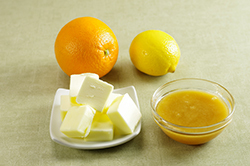 Whisk in the corn syrup and lemon juice and then drop in the chunks of butter. 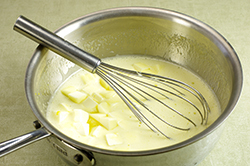 Put the saucepan over medium heat and start whisking, taking care to work the whisk into the edges of the pan. 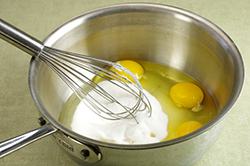 If your whisk is too big to clean the edges of the pan, switch to a wooden spoon or a silicone spatula. 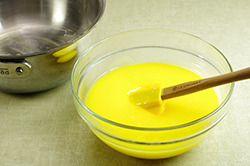 Keep heating and whisking the mixture without stopping. After about 6 to 8 minutes, you’ll notice the curd starting to thicken – it won’t be very thick, but the change is easily perceptible. 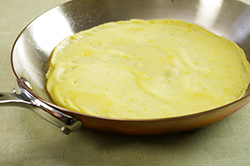 When the curd is thickened and, more important, you see a bubble or two burble to the surface and then pop immediately, remove the pan from the heat. 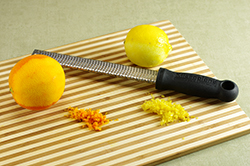 Scrape the curd into a heatproof bowl or a canning jar or two. Press a piece of plastic wrap against the surface to create an airtight seal, and let the curd cool to room temperature. Chill before serving. 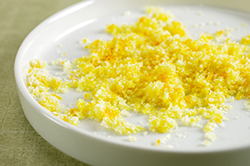 Serving: The curd can be used straight from the jar as a spread or a tart filling. 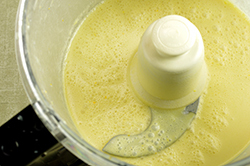 Storing: Packed into an airtight container – I always keep a piece of plastic wrap pressed against the surface – the curd can be refrigerated for at least 3 weeks.